His Holiness the 14th Dalai Lama, Tenzin Gyatso, is the spiritual leader of Tibet. He was born on 6 July 1935, to a farming family, in a small hamlet located in Taktser, Amdo, northeastern Tibet. At the age of two the child, who was named Lhamo Dhondup at that time was recognized as the reincarnation of the 13th Dalai Lama, Thubten Gyatso. 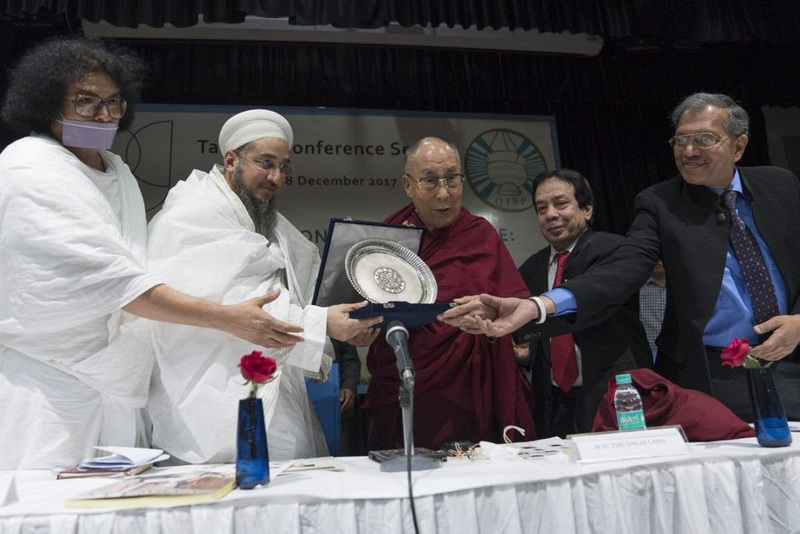 The Dalai Lama was conferred with the Syedna Qutbuddin Harmony Prize at the inaugural session of an inter-religious conference held at Jawaharlal Nehru University (JNU) in New Delhi . The prize was awarded in recognition of His Holiness the Dalai Lama’s outstanding efforts in building bridges and promoting peace. The Syedna Qutbuddin Harmony Prize, in memory of the 53rd Da’i al-Mutlaq, Leader of the Dawoodi Bohra people, is awarded annually to honour an individual or organisation whose work has had an exceptional impact in promoting harmony and peace in India as well as globally. 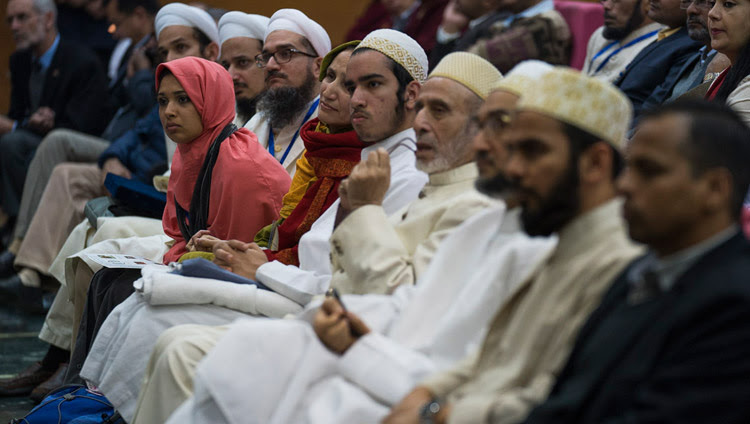 The conference organised by the Qutbi Jubilee Scholarship Program and the Centre of Arabic and African Studies of JNU was attended by spiritual leaders from various traditions including Syedna Taher Fakhruddin (member of QJSP), poet and Jain leader Acharya Dr. Lokesh Muni, philosopher and Hindu leader Shri Gaurgopal Das, Head of the Jewish community of Delhi Rabbi Ezekiel Isaac Malekar, Sikh leader Sardar Manjit Singh, Archbishop of the Roman Catholic of Delhi and former CJI Justice Ahmadi. In his address at the conference, His Holiness spoke about the power of spirituality in tackling destructive emotions such as anger and transforming negativity into positive emotions like love, contentment, tolerance and forgiveness. “We human beings are wonderful in some ways, but act as trouble makers in others. Our various religious traditions provide us with ways to tackle the destructive emotion that underpin our misuse of our intelligence. 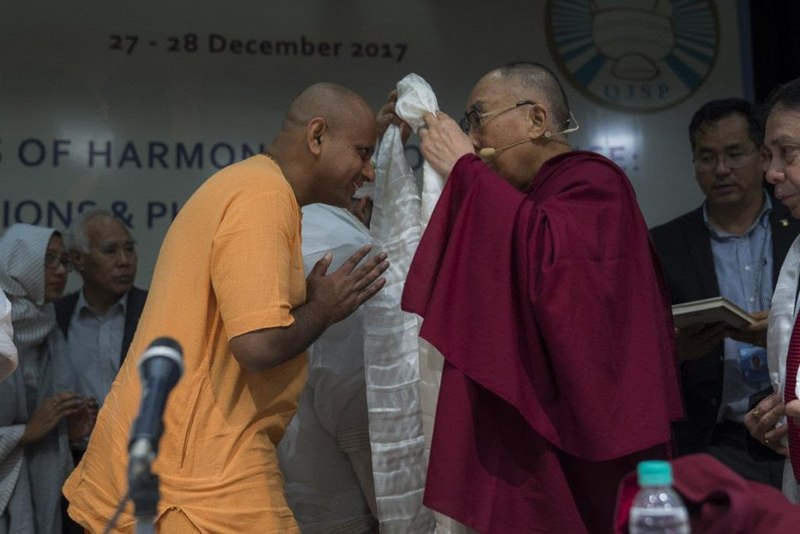 One way to reduce destructive emotions is to actively develop positive emotions like love, contentment, tolerance and forgiveness,” his Holiness said. His Holiness also spoke about the oneness of humanity and the essence of all religious traditions as being the same. His Holiness explained that it is the practice of these traditions that can bring about peace and harmony. 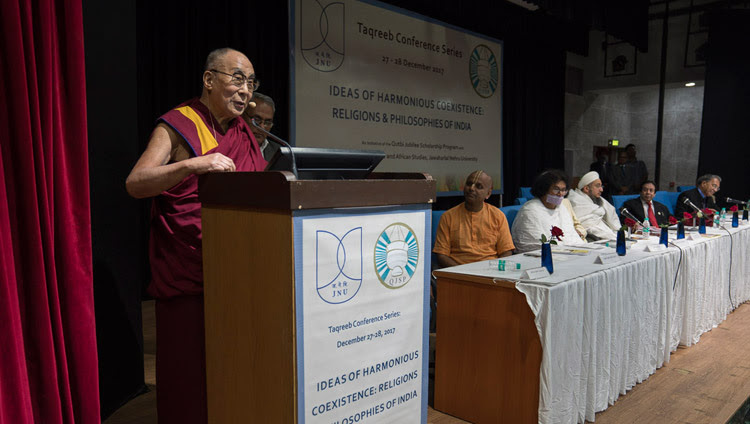 “All religious traditions have the potential to produce warm-hearted people, but unless we are sincere, it’s all too easy for religion to be further grounds for thinking in terms of ‘us’ and ‘them’,” His Holiness noted. Speaking about inner peace, His Holiness said that inner peace could only be brought about with emotional hygiene. “The cultivation of inner beauty—of being able to smile and show trust and concern for others is crucial. As social animals we need friends, but we don’t make friends through fear and anger. It’s by showing genuine concern for others’ well-being that we earn their trust and trust is the basis for friendship. His Holiness further lauded India’s rich ancient knowledge based on the study of mind and emotions, and how it have contributed to the peaceful coexistence of diverse religious traditions in the country. “This profound emphasis on the study of mind and its functions is extremely relevant in today’s world. Learning to achieve peace of mind is the basis for establishing peace in the world. And India is the one country that has the potential to combine its ancient knowledge with modern education for the wider benefit of the world at large,” His Holiness remarked.